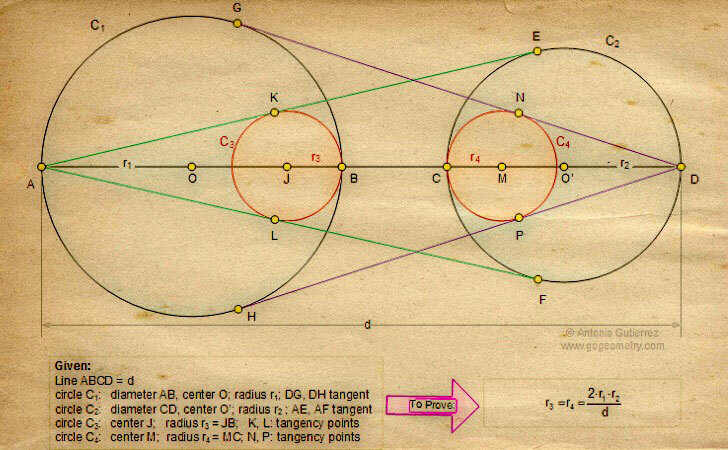 The figure shows a line ABCD = d with circles C1 of diameter AB and circle C2 of diameter CD. AE and AF are tangent to circle C2, DG and DH are tangent to circle C1. Circle C3 of radius r3 is tangent to C1, AE and AF at B, K and L, respectively. Circle C4 of radius r4 is tangent to C2, DG and DH at C, N and P, respectively. Prove that . See also: Problem 525. Home | Search | Software | iPad | PicSketch | Geometry | Problems | Visual Index | 10 Problems | Art | Email | Solution / Comment. Last updated: Jan 4, 2015 by Antonio Gutierrez.